On January 16 Specialty Retail Shops Holding Corp, DIP (Shopko) announced that it, along with its subsidiaries, has filed voluntary petitions for Chapter 11 (click here to request case updates). A day later, Shopko, DIP filed a Plan of Reorganization and Disclosure Statement, which considers a restructuring through either (a) a sponsor-led Equitization Restructuring or (b) an orderly liquidation under the Asset Sale Restructuring. The Plan expects a Disclosure Statement hearing date for February 22, voting deadline for March 25, and a Confirmation hearing for April 3. Also, a number of first day motions were approved, including authorizing payment of prepetition lien claimants, and 503(b)(9) claimants in the ordinary course of business, rejection of certain leases and procedures to assume, assign and reject contracts and leases; and approval to continue to use its cash management system, pay employee wages, continue benefits and establish bidding procedures for the pharmacy assets. The Court also approved on an interim basis the $480.0 million DIP financing. 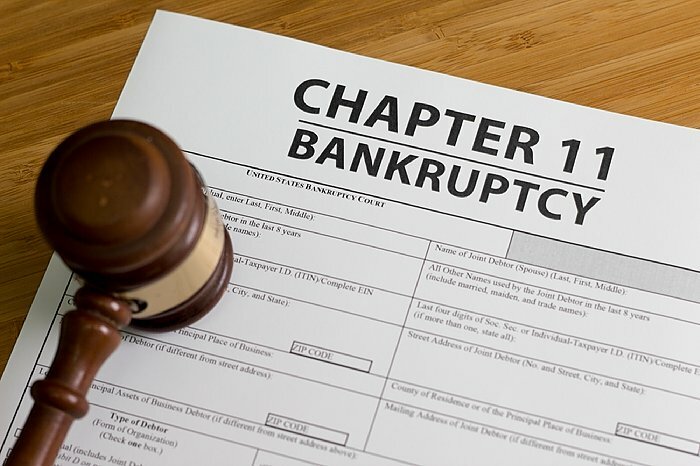 Meanwhile, McKesson filed a motion requesting a venue change for the Chapter 11 proceedings from Nebraska to Wisconsin (Eastern District), which is the Debtor’s principal place of business. McKesson stated that it appears that the Debtor engaged in forum shopping in an effort to neutralize creditor involvement, and the sole basis for choosing Nebraska is by virtue of the first entity listed by the Debtor in its petition being Pamida Transportation LLC. That entity is the only one of the Debtor’s formed under the laws of Nebraska, an entity according to McKesson that has no employees. The Debtor also listed that it operates 27 stores and one distribution center in Nebraska. See below for Shopko Store Closings Map - click here to request a list of closures. Founded in 2011 and based in Bedford, TX, privately owned Urban Air Adventure Park is the world’s largest adventure park operator, providing active entertainment for adults and children. The Company’s 65 indoor adventure parks average 50,000 square feet and offer wall-to-wall trampolines, dodgeball courts, obstacle courses, tube playgrounds, ropes courses, dunk zones, pro-zones, sky coasters, and rock climbing. Its parks also feature full-service cafés connected to lounges with Wi-Fi and big-screen televisions, and select locations offer indoor skydiving, go-karts and bumper cars. Urban Air’s adventure parks serve as popular venues for custom birthday parties, corporate and religious retreats, team building experiences and private events. The Company, which began franchising in 2014, currently has more than 85 new locations in varying stages of development, including two in the U.K. and one in Canada, with more than 60 of those set to open in the coming two months. AggData has many emerging brands with aggressive expansion plans on its radar, click here for more information. The Company said it has entered into an asset purchase agreement with Special Situations Investing Group, Inc. (SSIG), an affiliate of Goldman Sachs & Co. LLC, under which SSIG will serve as the stalking horse bidder in a Court-supervised sale process for Janie and Jack. As part of the asset purchase agreement, SSIG has agreed to acquire the Janie and Jack business and the intellectual property and online platform for Gymboree. Gymboree Group said it has received a commitment for a DIP Facility, which consists of $30.0 million in new money loans to be provided by SSIG and Goldman Sachs Specialty Lending Holdings, Inc. and a roll up of all of Gymboree's obligations under the prepetition Term Loan in an amount not less than $89.0 million. Management said that Gymboree, Janie and Jack, and Crazy 8 stores, along with its online platforms, are currently open and continue to serve customers. The Company will provide an update on plans for its Janie and Jack stores as the Court-supervised sale process progresses. On Friday, CVS Health announced it reached a multiyear agreement such that Walmart will continue to participate in the CVS Caremark pharmacy benefit management commercial and Managed Medicaid retail pharmacy networks. Financial terms of the deal were not disclosed. Earlier last week, the mass merchandiser announced it would be leaving CVS Caremark’s pharmacy benefit management commercial and managed Medicaid retail pharmacy networks, citing reimbursement rates, before the two companies returned to the bargaining table mid-week. Walmart and CVS Health already have an existing agreement in place for Walmart’s participation in the CVS Caremark Medicare Part D pharmacy network, and Walmart’s Sam’s Club division has an existing agreement to participate in the CVS Caremark pharmacy network. 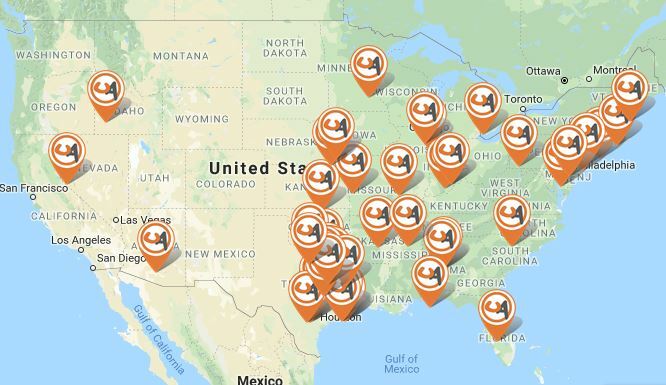 Including Walmart, the CVS Caremark national pharmacy network will have nearly 68,000 participating pharmacies, including independently owned, community-based pharmacies, local pharmacies in grocery stores, and mass merchants, as well as regional and national chains. Moran Foods LLC dba Save-A-Lot (SAL) announced it is cutting 100 positions from its corporate staff at its new headquarters in St. Ann, MO. In October, SAL embarked on a cost-cutting program in an effort to transform the brand and compete directly with ALDI and Walmart. Without disclosing performance metrics, management indicated they were pleased with the early results and noted the strategy was in planning long before it was announced. The Company anticipated the price cuts would initially lead to lower revenue, but with an eventual pick-up in basket size and transactions, the end result would be positive. The latest reporting shows fiscal 2018 third quarter comps down 5.6% and TTM sales of $4.10 billion. SAL’s greatest challenge has been to differentiate itself. The Company indicated it is making investments to improve the store experience, but the tremendous competitive pressures in the discount grocery segment continue to present a challenge. Payless ShoeSource is evaluating a possible sale or bankruptcy, according to published reports. The reports stated that the Company recently hired PJ Solomon to explore strategic alternatives. The Company previously filed Chapter 11 on April 4, 2017 and emerged from proceedings in August 2017, after shuttering 673 stores and shedding more than $435.0 million in debt. A group of creditors, including hedge fund Alden Global Capital, took over ownership. The Company currently operates approximately 3,500 stores worldwide. Following a challenging first half of the year, the second half of 2018 served as the backdrop for another wave of retail bankruptcies and store closings, as a number of brick-and-mortar operators struggle to evolve within a retail sector facing increased online competition, shifting consumer preferences, maturing debt, and lack of competitive positioning. Several iconic brands headed to the bankruptcy court in the back half of the year, most notably Sears, which is fighting to avoid liquidation after 125 years in business. Our Chapter 11 Recap provides a look back at the previous six months of Chapter 11 activity from all 94 U.S. jurisdictions and presents the data by month, industry and state of primary operation. GameStop completed the previously announced sale of its Spring Mobile business to Prime Communications for $700.0 million, excluding transaction fees and customary working capital and indebtedness adjustments. Spring Mobile owns and operates 1,284 AT&T wireless stores. The Company continues to conduct an on-going review of its strategic and financial alternatives to enhance shareholder value, and use of the proceeds from this sale will be determined based on the completion of that review. Such uses may include debt reduction, share repurchases, investments in core video game and collectibles business, or some combination of these options. The Company also reported that holiday sales decreased 5% to $2.63 billion for the nine-week period ended January 5, 2019. Comps increased 1.5%, including a 3.6% increase in the U.S., partially offset by a 3.1% decrease internationally. New hardware sales decreased 6.1%, as the strong growth in Nintendo Switch sales was more than offset by the successful launch of Xbox One X in the prior year period. In addition, Technology Brands sales decreased 19.3% on a reduced store count and lower store traffic. New video game software sales were down 8.3%, and pre-owned sales declined 16.4%. Meanwhile, video game accessories sales grew 28.7%, collectibles sales were up 3.7%, and digital receipts rose 16.8%. Taco Bueno completed its sale to Taco Supremo, LLC, an affiliate of Sun Holdings, and has successfully emerged from its Court-supervised financial restructuring. Taco Bueno filed for a pre-packaged Chapter 11 bankruptcy on November 6, and its Plan of Reorganization was confirmed on December 31. 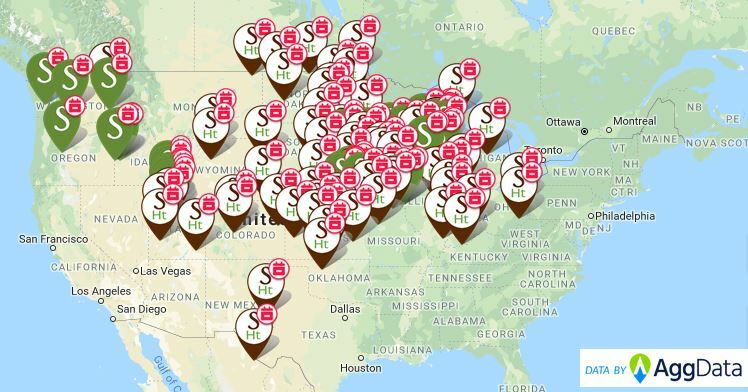 Sun Holdings, which plans to invest in remodeling Taco Bueno locations and other brand initiatives, is a multi-concept franchisee with more than 800 locations across eight states, including Burger King, Popeyes, Arby’s, Golden Corral, Cici’s Pizza, and Krispy Kreme. In other news, Domino’s appointed Stu Levy as its EVP of supply chain. Mr. Levy was most recently EVP, chief transformation officer for Republic Services, Inc. 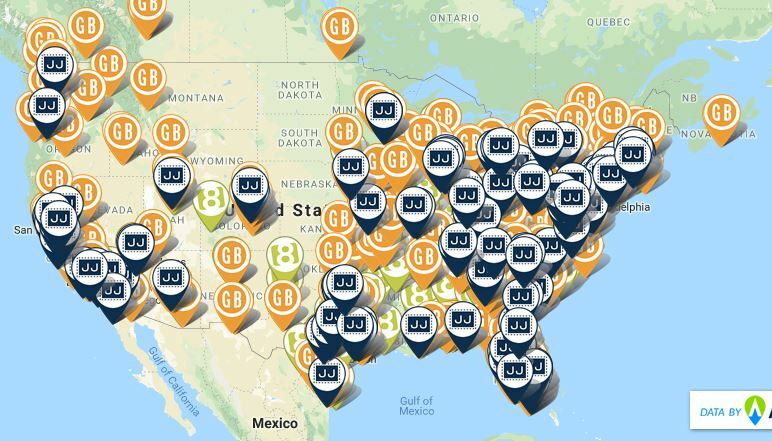 In celebration of its 10-year anniversary, AggData has announced several key company milestones, including the expansion of its retail location database to include more than 6,000 monitored companies and 5.5 million total locational records. The Company now maintains the largest international database with coverage in roughly 250 countries and territories. Peak Resorts completed its $31.0 million in capital improvements at Mount Snow and Hunter Mountain. On December 22, 2018, the Carinthia Base Lodge at Mount Snow opened; the 42,000 square-foot lodge is five times larger than the previous lodge and includes high-end amenities such as a full-service sit-down restaurant named Iron Loft, the new High Timer Lounge, and High Timber, a multi-station cafeteria, along with retail stores, rental facilities, tuning, and a private lesson desk. Reopened on December 24, Hunter Mountain added five new ski trails and four new gladed skiing areas (alpine skiing off-trail or through the woods), encompassing a 33% expansion of the resort’s terrain offerings. Hunter also added a high-speed, six-passenger chair lift and a fully-automated, low-energy snowmaking system. Peak Resorts has 17 ski resorts across the Northeast, Mid-Atlantic and Midwest. A report published last week claims that Target, looking to take advantage of the loss of the Toys “R” Us / Babies “R” Us chains and fill a perceived marketing gap, “is expanding its in-house brand Cloud Island, which currently sells items like crib sheets, stuffed animals and baby bath toys, to include essential items like diapers, wipes, toiletries, utensils and bowls …. Target had already started to remodel the spaces in its stores where it was selling things like cribs and strollers, putting more of those bulkier items on display and rearranging them so that they were near kids clothing and other overlapping categories. It started letting parents test out more items like car seats in stores before they buy them. And Target says those revamps are leading to sales increases.” The goods are expected to be priced under $10, 30% to 40% less expensive than comparable national premium brands, which Target will continue to sell. Click here to request a list of future Target locations. Staples is closing its 200,000 square-foot fulfillment center in Hanover, MD on March 16, eliminating 61 positions. The move is part of its previously announced plan to consolidate some of its smaller regional warehouses to a new, larger facility in Green Castle, PA. According to the Company, the move will help expand its capabilities and allow it to be more centrally located for its business. The Company said it is maintaining a smaller presence in Hanover, MD, with a new operations center opening near the existing facility; some of the associates will be transferred to the new location. Fastenal Company’s fourth quarter sales increased 13.1% to $1.23 billion, driven by higher unit sales related primarily to continued strength in industrial vending and from its Onsite locations, as well as higher product pricing. Fastener products sales grew 11.3% and represented 34.4% of sales. Non-fastener products sales were up 14.6% and represented 65.6%. Gross margin declined 110 basis points to 47.7% due to the impact of inflation and customer and product mix on product margins, and higher freight costs. Operating income improved 14.8% to $233.4 million, primarily due to the leveraging of employee-related, occupancy-related and other operating and administrative expenses. The Company signed 4,980 industrial vending devices during the quarter, an increase of 16.7% from the prior year, and 22,073 industrial vending devices during 2018, up 14% from 2017. It also signed 67 new Onsite locations during the fourth quarter and 336 during 2018, ending the year with 894 active sites. Fastenal plans to add 375 to 400 Onsite locations during fiscal 2019. Macy’s is closing its store in the Charleston Town Center in Charleston, WV as part of its real estate portfolio review for opportunities to improve the use of its assets. The Company said a clearance sale will commence in the beginning of February and run for eight to 12 weeks, before the store closes. Once the store closes, the closest Macy’s will be in Barboursville, WV (more than 40 miles away). The Charleston mall, which is scheduled for public auction on January 24, has been in receivership for nearly a year after its former owners defaulted on a $100.0 million loan. The mall has lost 40% of its tenants in recent years. Whole Foods Market has leased 33,000 square-feet of office space in Seattle, WA, located diagonally across from an office building leased to parent Amazon. The Company recently opened stores in Kirkland and on Seattle’s First Hill. As reported last week, Whole Foods is discontinuing expansion of its 365 banner, and published reports indicate that the Company is considering taking over former and closing Sears and Kmart store sites to add more Whole Foods grocery store locations and expand the number of customers it can reach for two-hour delivery. On Friday, the Company opened a newly constructed 51,000 square-foot grocery store in Newtown Square, PA.
Stater Bros. recently held grand re-openings for remodeled stores in Artesia, Highland and Menifee, CA. Enhancements included new lighting and flooring as well as the addition of more prepared foods. Grocery Outlet opened a new store on January 17 in Fountain Valley, CA. The Company operates approximately 300 stores in California, Idaho, Nevada, Oregon, Pennsylvania and Washington State. Southeastern Grocers’ Winn-Dixie banner debuted the “WD’s Taproom” concept, a taproom serving eight beers and 12 wines as well as coffee, fountain drinks, combo meals and to-go growlers, at its Neptune Beach, FL store on Friday. The store was remodeled in August and is one of the approximately 100 stores that Southeastern Grocers planned to update in 2018. Another area Winn-Dixie in Brierwood was remodeled last June.